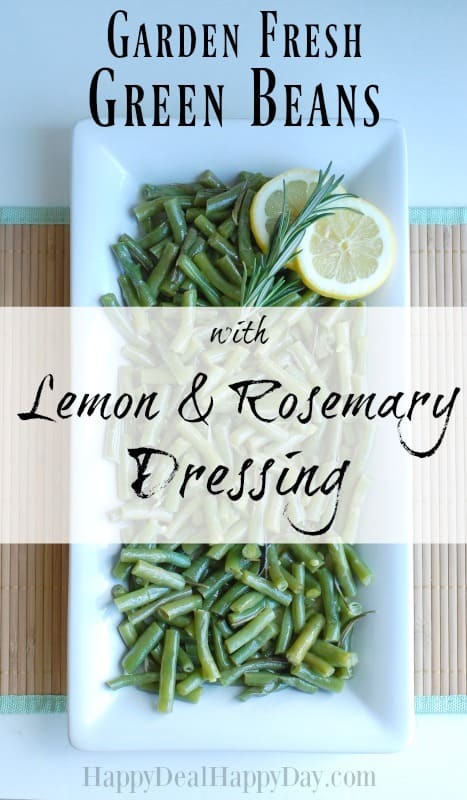 Garden Fresh Simple Green Beans Recipe with Lemon & Rosemary Dressing | Happy Deal - Happy Day! 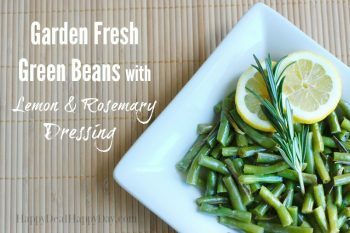 This garden fresh simple green beans recipe with lemon and rosemary dressing is a wonderful way to use your garden fresh green beans with a bit of a twist on flavor rather than the traditional olive oil, salt & pepper combo. I got this recipe from my husband’s uncle who made this for a summer family picnic. It was unique and delicious and I just had to share it with you! This is a simple green beans recipe using just 4 ingredients – fresh green beans, lemon, butter, and rosemary! The combo of lemon and rosemary is delish and I’m sure you will enjoy this twist on a favorite fresh garden veggie this time of year! Here is a unique dressing you can add to garden fresh steamed green beans as a wonderful side dish to any summer meal! Place 1lb of trimmed and cleaned green beans in a microwavable safe veggie steamer. Steam for 10 min, until tender. While the beans are cooking, mix together butter, rosemary, lemon juice, salt & pepper. Pour the lemon/rosemary dressing over the beans and toss. Serve right away, or let marinate for 30 min. and re-heat for more potent lemon flavor. Another twist on this recipe is to substitute the 1 tsp. of rosemary and instead add 1/2 teaspoon of nutmeg. That is also a wonderful and unique flavor that you can try with your fresh green beans! 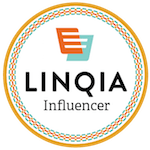 Find more easy & frugal recipe ideas over here! 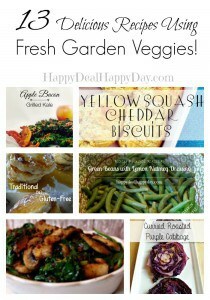 Check out these 13 Recipes Using the Garden Veggies post! or these 5 Ingredient or Less Dinner Recipes! ← MyFreeze Easy Monthly Menu Plan Printables – Shows You How To Prepare & Freeze 10 Meals in Less Than An Hour! I get to bring a veggie dish to Thanksgiving, and this looks so much better than drowning some poor innocent green beans in canned soup. LOL Audrey – but that canned soup….we are all addicted to it. 🙂 Hope you like this change!